International Journal of Research in Health Sciences,2013,1,3,209-212. 1-Asst. Professor, MGIMS, Sewagram. 2-PG Student, MGIMS, Sewagram. 3-Asst. Professor, MGIMS, Sewagram. 4-Ex Professor, Dept. of Physiology, Seth GS Medical College & KEM hospital, Mumbai, Maharashtra, INDIA. Introduction: While medical students are trained to improve the health of others, they often lose sight of their own. They are under constant physical and psychological stress due to strenuous medical programs. Stress disturbs the homeostatic mechanisms of the body and has damaging effects on various parameters of the body; one of the parameter is blood glucose. Pranayama is one of the stress relaxation technique which helps in maintaining the homeostasis. Aim: The objective of the present study is to study the effects of pranayama on blood glucose level in medical students. Materials and Methods: The case-control study was conducted on 60 medical students of 17-20 years of age from tertiary hospital for 8 weeks. Students were divided into two equal groups (Study group & Control group).Study group subjects practiced pranayama for 8 weeks whereas control group subjects were busy in their routine work. Blood glucose levels were measured before and after intervention period from all participants. All necessary ethical clearance & consents were taken from relevant authorities before conducting study. 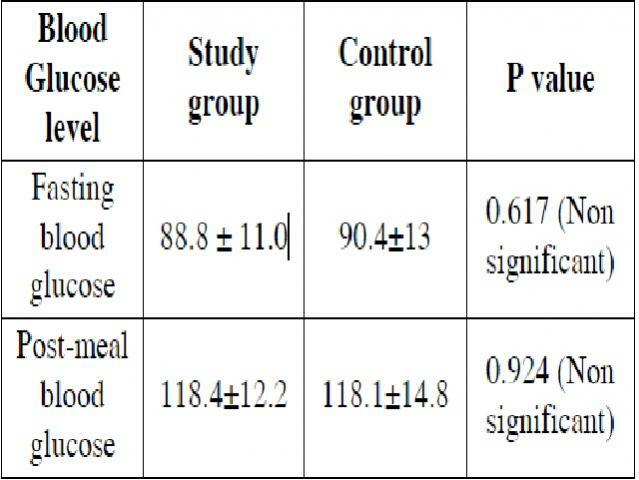 Results: Both fasting as well as post meal blood glucose levels were significantly reduced (p value <0.05) in subjects after practicing pranayama for 8 weeks, whereas in control group subjects changes were statistically non significant. Conclusion: Observations of the present study suggest that short term interventions like pranayama helps in reducing blood glucose level.